This pharmaphorum webinar, which was held in partnership with Complete HealthVizion, looked at how to measure medical communications activities, how to continue with what is successful and how to change what isn’t working. Medical communications activities often fail because they are not based on a true understanding of human behaviour and the decision-making drivers and social nuances that underpin it. So, as part of this digital debate on meaningful metrics, the expert panel also looked at how behavioural science can provide a framework to develop smarter communications and, ultimately, drive better patient outcomes. In doing so they also discussed the role of behaviour and the implications of this for measuring success. 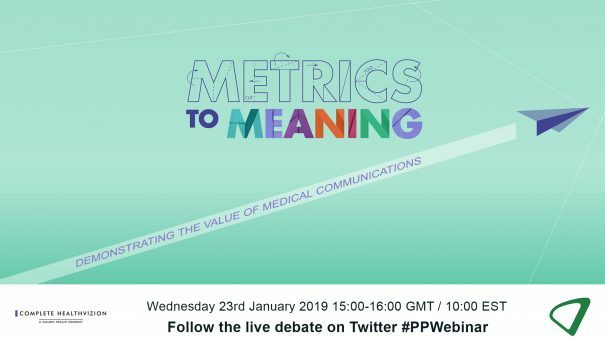 This Metrics to Meaning webinar took place on Wednesday, 23 January, at 15:00 GMT (10:00 EST) and outlined how to measure the effectiveness of different types of medical communications programmes. To view the webinar on demand, please click here or on the button above or below. Scott McGregor is currently in the role of Associate Director of External Scientific Communications (Gastroenterology and Hepatology) at Allergan driving strategic planning and execution of these therapeutic areas. Scott received his Ph.D. and M.S. in Clinical Psychology from Jackson State University and University of Central Florida, respectively. Scott previously worked in a similar role at Eli Lilly where he worked for 14 years. Over that 14 years, Scott held roles with increasing responsibility and scope within the publications and communications realm for multiple Neuroscience and Men’s Health compounds encompassing 23 compound plans in all. Lynda has over 11 years’ experience in medical communication as well as 7 years’ experience in academic research. David has worked in medical communications for 14 years, leading medical affairs and marketing programmes on behalf of a range of big pharma and small biotech companies, across a wide range of therapy areas. During this time David’s focus has been on creating meaningful communications that have impact: seeking to use the most appropriate analytics and feedback mechanisms to measure usage or uptake, and ultimately to ensure the desired behaviour change is achieved in the target audience.